First study on Anabolic Steroids using Olympic Athletes. ABSTRACT. The purpose of this study was to investigate the effect of anabolic steroid upon the nervous system by measuring the various reflex components of the knee jerk reflex. A double blind technique was used in this study. 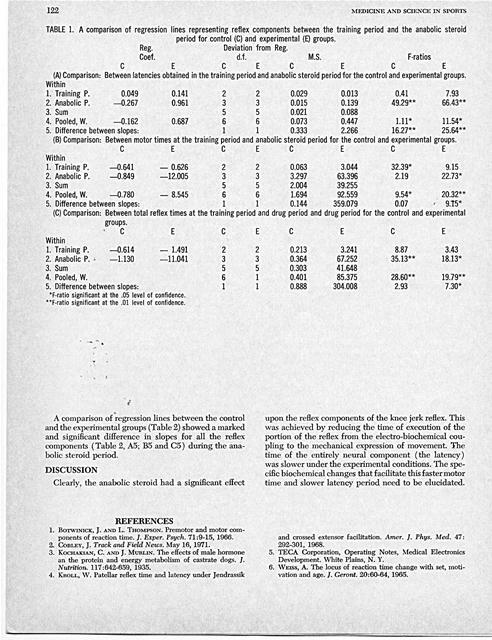 The anabolic steroid (Dianabol) had a significant effect upon the reflex components of 6 male subjects. Significantly faster Motor Times and significantly slower Latencies were obtained. From) these results it can be concluded that the anabolic steroid acted upon the central nervous system and the biochemical processes involved in the reflex. 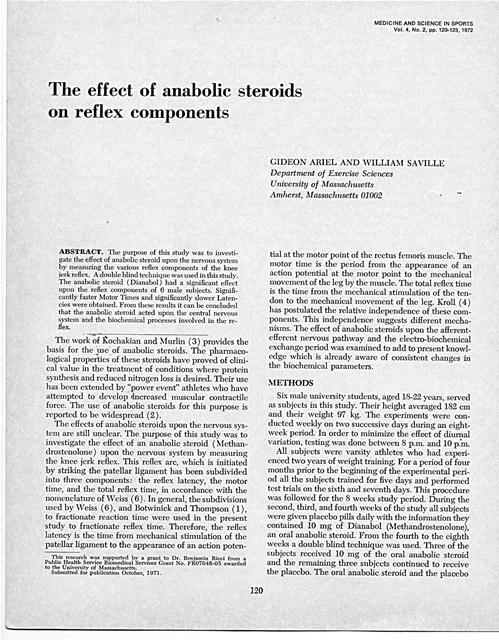 The work of koehakian and Murlin (3) provides the basis for the use of anabolic steroids. The pharmacological properties of these steroids have proved of clinical value in the treatment of conditions where protein synthesis and reduced nitrogen loss is desired. Their use has been extended by "power event" athletes who have attempted to (levelop dnereased muscular contractile force. The use of anabolic steroids for this purpose is reported to be widespread (2). This research was supported by a grant to Dr. Benjamin Ricci from a Public Health Service Biomedical Services Grant No. FR07048-05 awarded to the University of Massachusetts. Submitted for publication October, 1971.
tial at the motor point of the rectus femoris muscle. The motor time is the period from the appearance of an action potential at the motor point to the mechanical movement of the leg by the muscle. Thee total reflex time is the time from the mechanical stimulation of the tendon to the mechanical movement of the leg. Kroll (4) has postulated the relative independence of these components. This independence suggests different mechanisms. The effect of anabolic steroids upon the afferentefferent nervous pathway and the clectro-biochemical exchange period was examined to acid to present knowledge which is already aware of consistent changes in the biochemical parameters. Six male university students, aged 18-22 years, served as subjects in this study. Their height averaged 1.82 cm and their weight 97 kg. The experiments were conducted weekly on two successive days during an eightweek period. In order to minimize the effect of diurnal variation, testing was done between 8 p.m. and 10 p.m.
were assigned to the subjects by code by the University Health Service and the investigators were not informed what the subject actually received until after the 8 weeks testing period. Total patellar reflex time and reflex latency were obtained on the right limb. A Lafayette knee reflex apparatus was used with an adjustable hammer to deliver a strike to the patellar ligament. The hammer was released at a 60 degree angle. The subject was comfortably seated with his heel held relaxed against an adjustable plate depressing a microswitch. The recording was started when a microswitch in the hammer was activated by the strike. This microswitch closed the circuit, causing an electric Hunter clock counter to start when contact was made by the hammer head with the patellar ligament. As soon as the reflex arc was completed. a mechanical movement of the limb caused the subject's heel to lose contact with the heel plate which again opened the circuit and stopped the electric clock. The time elapsed is the total reflex time. Electrodes for recording the EMG were placed directly over the rectus femoris motor point which was located by the standard procedures indicated in the TECA Operator's manual (5) for the variable pulse generator and chronaximcter model CH3. The electrodes were connected to the TECA Electrornyograph model B2 oscilloscope. At the time when the hammer struck the patellar ligament, a beam swept across the oscilloscope, and as the nerve impulse reached the motor point electrodes, a spike potential was displayed on the oscilloscope. This time interval was the latency. Ten reflex trials were taken consecutively on each subject at each testing session. Data are reported for the control (placebo) and the experimental groups (Dianabol), and comparisons between the training period (1st four weeks) and the anabolic steroid period (last four weeks) have been statistically tested. Figure 2-Reflex components in training and anabolic periods. the anabolic steroid period. This lengthening of the latency component was statistically significant despite the small mean difference. The faster motor time and its effect upon the total reflex time are clearly seen to be more marked for the experimental group who received the anabolic steroid during this period. A comparison of regression lines between the training and the anabolic steroid periods yields the following results (Table 1). The control and the experimental groups demonstrated significant differences between the slopes of the regression lines for latencies (Table 1, A5). The regression slopes were significantly different between the training and the anabolic steroid periods in the motor and total reflex times for the experimental group (Table 1, B5 and C5). Figure 1-Relative percentage of reflex components. TABLE 1. A comparison of regression lines representing reflex components between the training period and the anabolic steroid period for control (C) and experimental (E) groups. Reg. Deviation from Reg. (A) Comparison: Between latencies obtained in the training period and anabolic steroid period for the control and experimental groups. for the control and experimental groups. *F-ratio significant at the .05 level of confidence. **F-ratio significant at the .01 level of confidence. 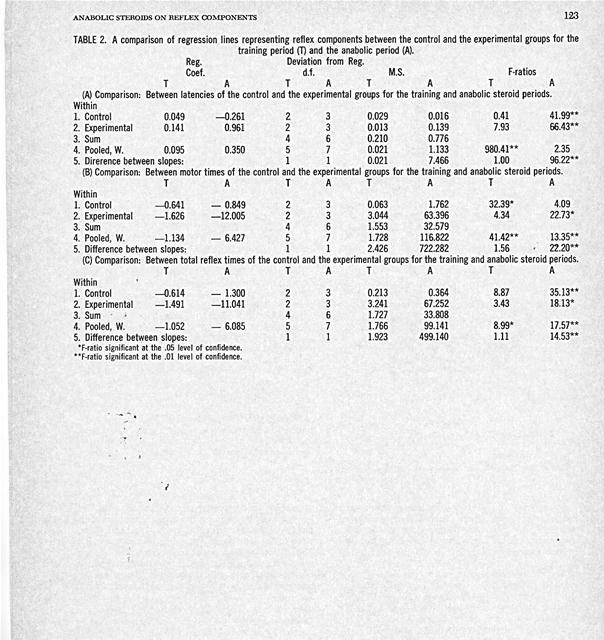 A comparison of regression lines between the control and the experimental groups (Table 2) showed a marked and significant difference in slopes for all the reflex components (Table 2, A5; B5 and C5) during the anabolic steroid period. ponents of reaction time. J. Exper. Psych. 71:9-15, 1966. 2. COBLEY, J. Track and Field News. May 16, 1971. 3. KOCIIAKIAN, C. AND J. MURLIN. The effects of male hormone an the protein and energy metabolism of castrate dogs. J. Nutrition. 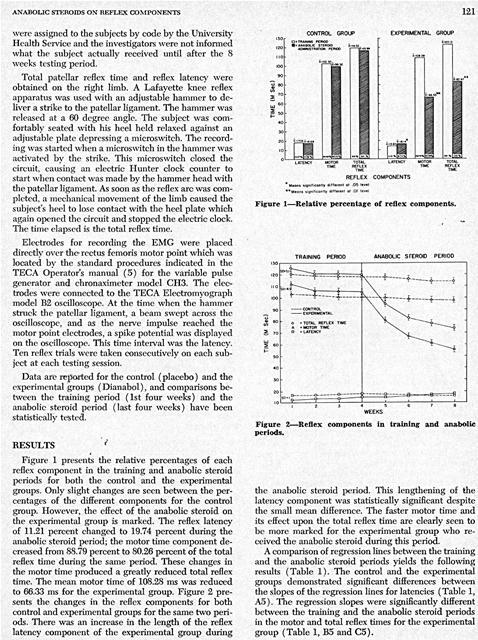 117:642-659, 1935.
upon the reflex components of the knee jerk reflex. This was achieved by reducing the time of execution of the portion of the reflex from the electro-biochemical coupling to the mechanical expression of movement. The time of the entirely neural component (the latency) was slower under the experimental conditions. The specific biochemical changes that facilitate this faster motor time and slower latency period need to be elucidated. and crossed extensor facilitation. Amer. J. PhDs. Med. 47: 292-301, 1968. 5. TECA Corporation, Operating Notes, Medical Electronics Development. White Plains, N. Y. 6. WEiss, A. The locus of reaction time change with set, motivation and age. J. Geront. 20:60-64, 1965. TABLE 2. A comparison of regression lines representing reflex components between the control and the experimental groups for the training period (T) and the anabolic period (A). Reg. Deviation from Reg. (A) Comparison: Between latencies of the control and the experimental groups for the training and anabolic steroid periods. (B) Comparison: Between motor times of the control and the experimental groups for the training and anabolic steroid periods. (C) Comparison: Between total reflex times of the control and the experimental groups for the training and anabolic steroid periods. *F-ratio significant at the .05 level of confidence. **F.ratio significant at the .01 level of confidence. Generated on 4/25/2019 12:56:33 AM (PST) ADI/HQ/GBA/2019/ARIELCLOUD/v3.0.2018.0126.